All are welcome to join us at the church in Monteton on Sunday 28th April at 10:30am for a service of BCP Morning Prayer, led by Rev'd Tony Lomas. Hope to see you there! During Lent, a series of simple soup and bread lunches were held, accompanied by Prayer and Meditation led by Barrie and Ainsley Green. The Church of Notre Dame is located off the D423 between Miramont-de-Guyenne and Duras, about 6 kms south west of Eymet and the Dordogne. The congregation at Monteton has been meeting for over 30 years in this church. Originally, a group of friends met in the homes of the Atkinson families but numbers grew and larger premises were soon needed. We are grateful to Abbé Grimaud who, all those years ago, made us so very welcome in this church. Our congregation: We are part of the Church of England and our services are Anglican, as are most of our members, but others come from a variety of backgrounds including Methodist, United Reform Church, Baptist, Church of Scotland, The Brethren and other denominations: all are welcome! Church of England forms of worship are used at all services. Morning Prayer, Evening Prayer/Evensong and Holy Communion follow traditional forms and our Service of the Word, Prayer and Praise, is more informal. 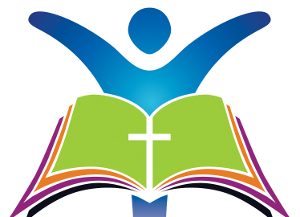 Our service schedule is as follows: (changed April 2019) Services every Sunday at 10:30: Prayer & Praise every first Sunday, Holy Communion every second and fourth Sunday, BCP Morning Prayer every third Sunday, and a Special type of service every fifth Sunday. All are welcome! We have been gathering during Lent, for prayers and meditation, followed by a light soup, bread and cheese meal. Our Ecumenical Service of Lessons and Carols took place on Tuesday 11th December in a candlelit church decorated with festive greenery and in the company of our French friends and their priest, Père Taillade, from the local Roman Catholic congregation. Our Assistant Chaplain, Rev'd Liz Morris and Parish Priest, Père Taillade, led the service jointly whilst members of the French congregation read some of the Lessons. It was a moving experience to hear these traditional readings spoken in French, as it was to hear Père Taillade’s thoughtful message in his homelie, where he spoke warmly of the coming together of the two communities. The Monteton Choir, led by Marjorie, gave us a selection of beautiful English and French carols which interspersed the readings, including Boris Ord’s setting of ‘Adam lay ybounden’, John Rutter’s glorious ‘Nativity Carol’ and David Wilcock’s setting of ‘Quelle est cette odeur agreable’, then led the congregational singing of other well-loved hymns and carols. Simon Kenworthy, on our wonderful ‘new’ organ, really pulled out all the stops! The beautiful little church of Our Lady was full to bursting, the French numbering at least half of the 130 in the congregation, and our French friends were full of praise for the event as they tucked into the vin chaud and mincepies served afterwards. Many thanks to all those who made this such a success, Revd Liz and Père Taillade, Marjorie, Simon, the choir and visiting members, but also not to forget those kind makers and servers of mincepies and mulled wine! Our Service of Remembrance on Sunday 11th November took place within the format of Morning Prayer. 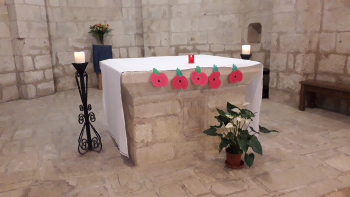 Roger Verrall led what was a very moving celebration of Remembrance and of the Armistice in the beautiful, quiet and calm setting of the church at Monteton, the altar hung with the simple, red poppy motif. In his address, Roger urged us to remember not only those who served in the military but also those in the auxillary services, ambulance volunteers, firemen, medical doctors and nurses, wardens, home guard and all the other men and women who gave their lives in times of war. This we thought of as we listened to the haunting trumpet sound of the Last Post, followed by the Reveille, and during Roger’s reading of the John McCrae poem, ’In Flanders’ fields’. In spite of our service coinciding this year with many local Commune ‘Jour de l’Armistice’ events, we drew a good number in the congregation. We were fortunate to have Richard Errington to accompany us on the organ and Brigid to aid Marjorie and our reduced number of choir members, in the leading of the singing of well-loved congregational hymns. Our service of Harvest Festival on 30th September was led by Roger Verrall and took place amongst beautiful seasonal decorations and generous gifts of non-perishable foods which were later donated to, and gratefully received by, our local branch of the French charity 'Secours Populaire de France'. The day before, we also enjoyed a wonderful barbecue Harvest Lunch on Saturday 29th September at the home of Jim and Dorothy Browne near Lauzun. In the warm late summer sunshine, over 50 people, friends old and new, sat in the shade of the barn at beautifully arranged tables whilst Rev'd Liz and husband Richard manned the barbecue and Charles and Elizabeth Clarke regaled us with Kir aperitif, elderflower spritzers and local wines. A splendid raffle was held of donated prizes and we raised over 750 euros for Chaplaincy funds and Chaplaincy sponsored charities. Our most sincere thanks go to Dorothy and Jim for welcoming us to their home and for all their hard work before and after, to Liz and Richard, to Charles and Elizabeth, and to all the friends who contributed to the delicious meal and to the setting up tables…. the list could go on and on! It was both a most successful event and a day of fellowship to remember! The first Ploughman’s Lunch held at the home of Charles and Elizabeth Clarke on Saturday 14th July was a delightful occasion attended by 28 people and raised funds for our Church charities. Many thanks to the Clarkes for all their hard work on what will have been one of the hottest Bastille Days! What a lovely service held at Monteton church on Sunday 8th July, shared with the Roman Catholic community, celebrating the Flower Festival weekend at Monteton. We give thanks for these artistic creations which made the church so welcoming and colourful. Many thanks to all who contributed to making this such a special occasion. By the normal run of events the morning service for 20th May would have been in the usual style of Prayer and Praise. However, it being Pentecost Sunday, Holy Communion was incorporated into the service, which was led by Rev'd Liz Morris. Innovation didn’t stop there as instead of seating the congregation in rows a circle was formed including Liz herself. Communion was made special by passing the (real) bread and wine round the circle, each member presenting it to their neighbour. A stimulating and memorable experience. Our service for Palm Sunday was led by Rev'd Louise Courtney and included a beautiful and very moving tri-part reading of St Mark’s Gospel by Norma Eckett, Janet Tarr and Ron Tillyer. The congregation joined in the rousing singing of much loved Palm Sunday hymns whilst the choir gave us John Rutter’s setting of “God be in my head”. In spite of wet and windy weather, we gathered together again on the evening of Maundy Thursday for a solemn service of Holy Communion celebrated by Rev'd Liz Morris, with Liz carrying out the Washing of Feet and the final silent Stripping of the Altar. Easter Sunday Holy Communion was again celebrated by Rev'd Liz Morris, beginning with James Gibbs’ wonderful peal-of- bells “Introit for Easter Day” by the choir, its numbers boosted by ‘the swallows’ - our talented band of holiday visitors – and with Roger Williams at the organ. The choir also gave us Thatcher’s lovely Anthem “Come ye faithful” and the very large congregation enjoyed the singing of the Easter hymns. It was on this occasion that we marked also the formal retirement of Lay Reader Roger Verrall, thanking him for ten years of service to our congregation, but hoping that from time to time he might step in to lead us again. The service of Morning Prayer on 8th April saw our choir still boosted by our ‘swallows’ in the singing of Rutter’s setting of “For the Beauty of the Earth”, augmented at the organ by the son of Adrian and Peps Inscoe , (second organist at Norwich Cathedral), a great treat! Here is a photograph of one of the Fellowship Lunches. A particular thank you to Norma Eckett for the magnificent textile church banner she has produced from ‘bricks’ contributed by members of the Lot et Garonne congregations, and which will hang in rotation in each of the churches. Norma Eckett continues to host a monthly ‘drop-in’ Coffee and Cakes morning. 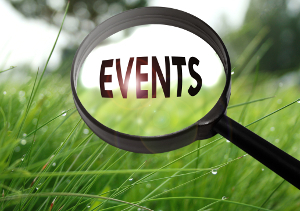 The next event will be held on Saturday 2nd March 2019, from 10.00 am until 12:00 noon, at Norma and Leslie’s home Le Bousquet, 47120 Auriac sur Dropt, situated on the D668 between Allemans du Dropt and Duras. Singles Together in Friendship - "Seuls ensembles"
"A new group where we can share and grow. There are always new skills to learn, skills to exchange, and a world of opportunities to explore with help and encouragement from others." Visit the new website by clicking here. 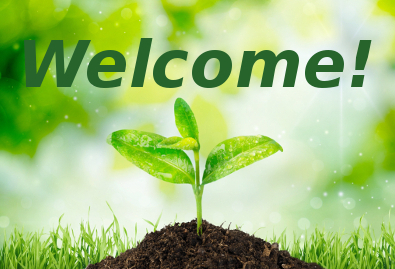 The New Road Group is a self-help group for bereaved people. It meets on the last Monday of each month from 15h30 – 17h30. If you know of anyone who might be interested, please contact Rev'd Liz Morris on 05 53 23 40 51 for further information. The Exploring Silence Group meets on Wednesday mornings at 10h00. Contact Rev'd Liz Morris, as above, for further details. Monteton Church Choir is hoping to recruit new members. Soprano, Alto, Tenor or Bass, all are welcome to join us. Monteton has had a choir for over 40 years and has built up a tradition of choral singing in the services. If you enjoy singing and could commit yourself to two practices a month, on the 2nd and 4th Saturdays at 14.30 in the church, then come along, we would be very happy to see you! We may also be interested in other anthems or other church music. Why not have a look around ? I have always believed in the power of prayer and especially collective prayer, as a result I place great value on the Prayer Chain. Over the past year, I have felt privileged to be be involved in co-ordinating of the Lot et Garonne sector of The Chaplaincy Prayer Chain. I was grateful for the opportunity to repay my debt to the Prayer Chain as I am particularly fortunate, and give thanks, that when my grandson was very ill the prayers of those in the Prayer Chain were answered. Sadly, this is not always the case. However, those who have requested our prayer may gain some comfort from knowing that they are being remembered in people’s prayers. Take an active and very rewarding part in the life of our church at Monteton! 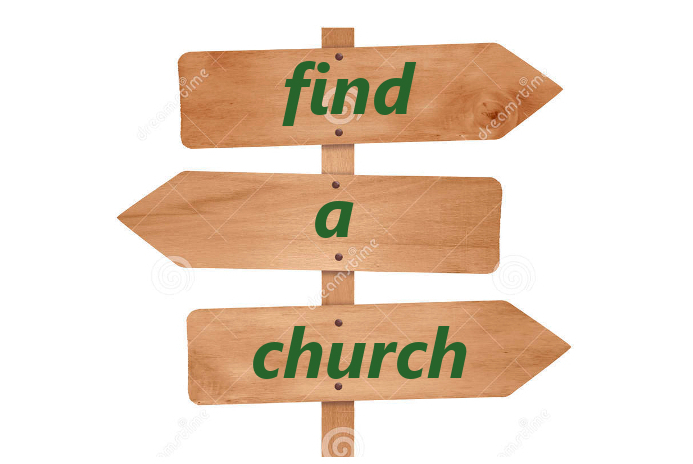 Some key members of our congregation have moved from the area and we need replacement people to fill these duties. Sidesperson duties are not onerous and involve helping the Wardens to set out the church for the service, welcoming people to the service and handing out service books. 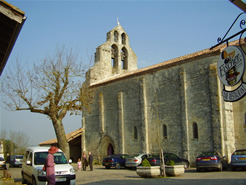 The church in Monteton is a listed building and is regarded as the finest Romanesque church in the area. It is a great privilege for us to be able to use such a beautiful building, indeed we are warmly welcomed to do so by local Roman Catholic clergy, the Maire and the Commune. Please help us to make it look even more beautiful for our services by providing flowers for a particular Sunday, perhaps in memory of a loved one or for a celebration. A rota for this can be found on the church Notice Board at the end of every service.